In the post Obama and stereotypes I speculated how the election of Barack Obama might affect stereotypes and vulnerability to stereotypes. Thinking about the amazing studies by Claude Steele and Joshua Aronson and other researchers (see for instance this post: 5 Experiments that make you think) I wondered whether it might enhance things like test performance and academic performance of African Americans. An article in The New York Times (Study Sees an Obama Effect as Lifting Black Test-Takers), describing research by Ray Friedman, David M. Marx and Sei Jin Ko suggested that, ideed, there might be such an Obama effect. But Joshua Aronson commented that the design of the study in question was problematic so that there was no reliable evidence for this presumed Obama effect. 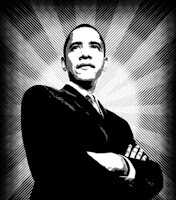 "Past research on stereotype threat and role model effects, as well as a recent quasi-experiment (Marx, Ho, &amp; Freidman, this issue) suggested the possibility of an “Obama effect” on African American’s standardized test performance, whereby the salience of Barack Obama’s stereotype defying success could positively impact performance. We tested this reasoning in a randomized experiment with a broad sample of college students from across the country. Specifically, we tested the hypothesis that students prompted to think about Barack Obama prior to taking a difficult standardized verbal test would improve their performance relative to white students, and to African American students in control conditions that were not prompted to think about Obama. Our results did not support this hypothesis. Test scores were unaffected by prompts to think about Obama and no relationship was found between test performance and positive thoughts about Obama, a disconfirmation of both the findings and conclusions of the Marx, Ho, and Freidman study." Also read: No O Effect? I guess too good to be true. Thanks for researching and posting this!! As far as we know, priming black students with black sports athlete works. It has an effect. So I was wondering: the Obama effect is not there because it was not there to begin with; or it was there at first, and now Obama has become "just a politician" in the kids' views? Interesting thought. What is considered a role model? What happens when we understand something? Who is the first to notice improvement?